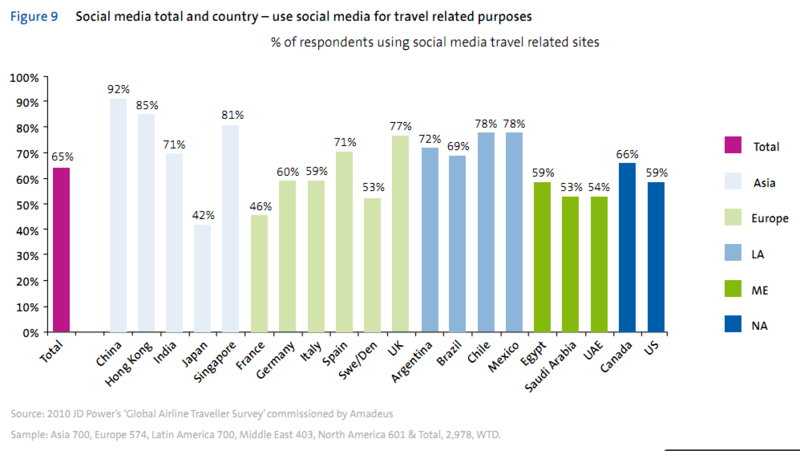 The latest installement of the Edelman Trust Barometer has now been published and as usual, it is interesting reading. This year, there have been some dramatic changes in the views of the public in most of the countries surveyed. Trust in government, business and NGO’s is declining while trust in media is rising. Trust in government shows an exceptionally sharp drop in the 2012 Barometer, after rising steadily for four years. In Sweden (“informed public”), trust in government is quite stable, dropping only from 64% to 62%, making Sweden the market with the fourth highest level of trust in government. Trust in business is also decreasing, although in Sweden it is acutally up from 52% to 54%, possibly thanks to the relatively stable Swedish economy compared to many other countries. 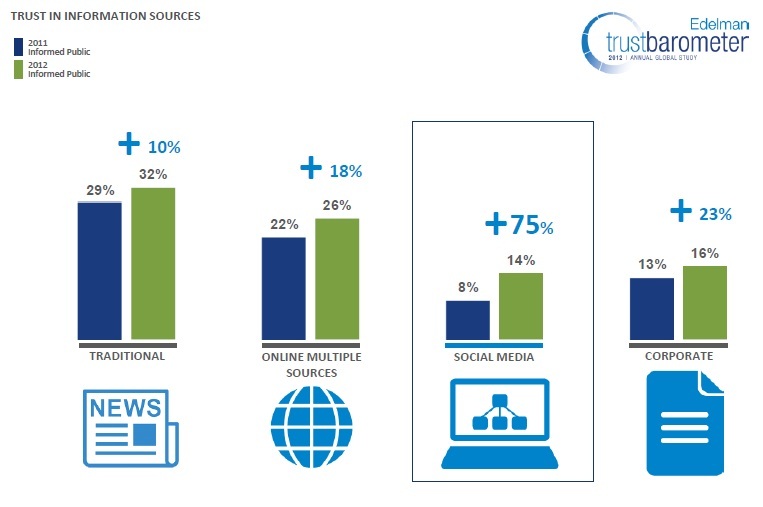 If we look at different media sources, it is interesting to see the dramatic increase in trust in social media, now almost at the same level as corporate information. Note: responses are for “informed public”, i.e. college educated, high income, high media consumption. 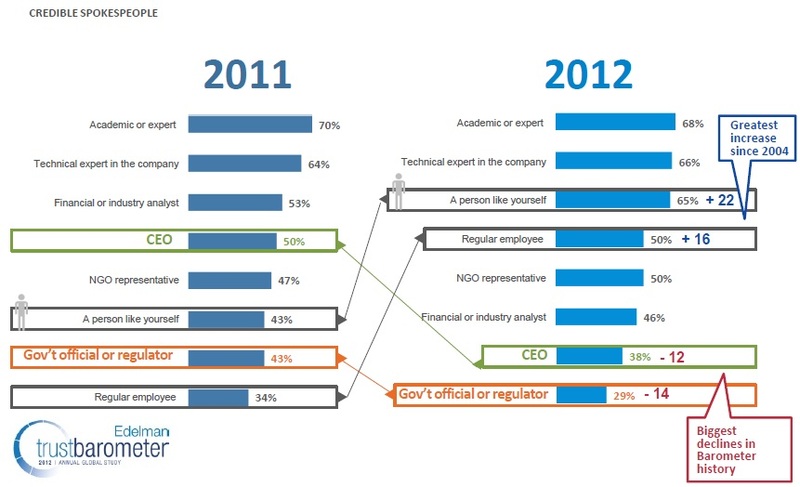 Overall, there is a huge drop in trust for CEO’s while trust in pers such as regular employees and “a person like yourself” is increasing dramatically. In other words, there is less trust in messages communicated by CEO’s through traditional corporate channels and increased trust in messages from our peers, communicated through for example social media channels. There’s a lot more to read and you’ll find the whole presentation here below. St. Paul’s Hospital in Vancouver and some of its doctors got sued by a patient who claims that she suffered a stroke due to malpractice during an operation. The stroke caused cognitive impairment of her thinking process and has negatively affected her social life, she claims. The defendant doctors applied to gain access to her Facebook and Twitter accounts, as well as her laptop computer, iPhone and digital camera in order to probe her online and digital social life. Free speech is under pressure as India has threatened to take action against sites like Facebook, Google and Twitter, if they refuse to remove blasphemous and politically inflammatory material from their sites. Kapil Sibal, India’s telecommunications minister, has suggested that online content should be pre-screened and that social media sites need to find mechanisms to monitor and block the release of “offensive material”. 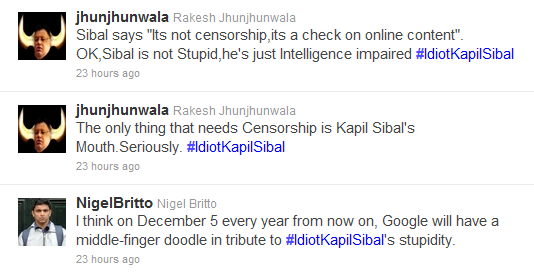 The controversial suggestion sparked a frenzy of online comments, with the hashtag #IdiotKapilSibal becoming a trending topic in India on Tuesday. Read more here and here. Micro blogging is catching on fast in China. The local Twitter-like networks Sina Weibo and Tencent Weibo now have some 250m and 300m registered users, respectively. Social media adds another dimension to watching tv. 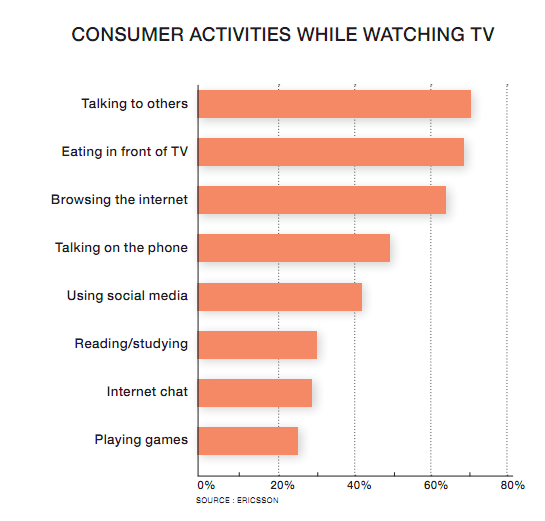 According to a new study, “TV & Video Consumer Trend Report 2011” from Ericsson ConsumerLab, more than 40% of consumers use social media while they are watching tv, on a weekly basis. Data was collected in Australia, Austria, Brazil, China, Germany, the Netherlands, Russia, Spain, Sweden, Taiwan, the UK, the US and South Korea. Full report in pdf here. Maybe I’m old fashioned, but if I was considering doing something illegal, I’d probably not choose a situation where there were thousands of cameras around. Then again, I’ve never been in a riot. 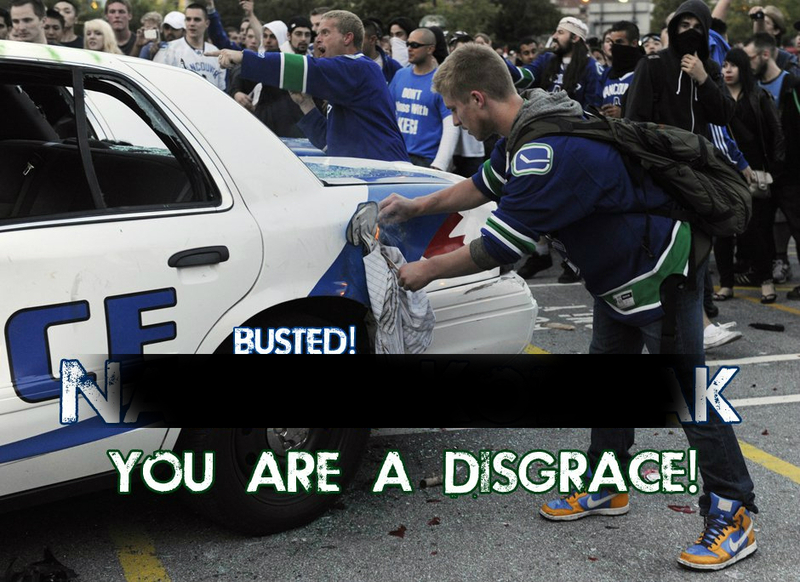 As you’ve probably already heard, there were riots in Vancouver this week after the city’s hockey team Vancouver Canucks lost the Stanley Cup title to the Boston Bruins. All over the town, people were taking photos and videos of rioters looting and smashing cars. With a quick search for “Vancouver riots” we can find more than 1,000 videos on YouTube and close to 4,000 photos on Flickr from last week. Conclusion: social media is a gold mine for those who wish to identify the rioters. And those are for example the Vancouver Police Departement and citizens that want to name and shame to looters. On Facebook, there are several groups and pages with titles like “Vancouver 2011 Rioters Public Humiliation Page” and “Help vancouver: post pics and video of rioters and looters”. Some of them claim to have identified individuals in the photos and reveal it in photos like the one below. “The response from the public wanting to help the police identify the individuals involved in criminal activity that occurred after Game 7 of the Stanley Cup Finals on the night of June 15, 2011 has been tremendous”, VPD says in a statement. VPD is also actively using Flickr and YouTube to communicate, and the VPD Twitter account is used to help solve crime. Finally, I love this photo that was posted on the VPD Facebook page. The VPD had parked a car in Greenville, to help with the clean up effort. 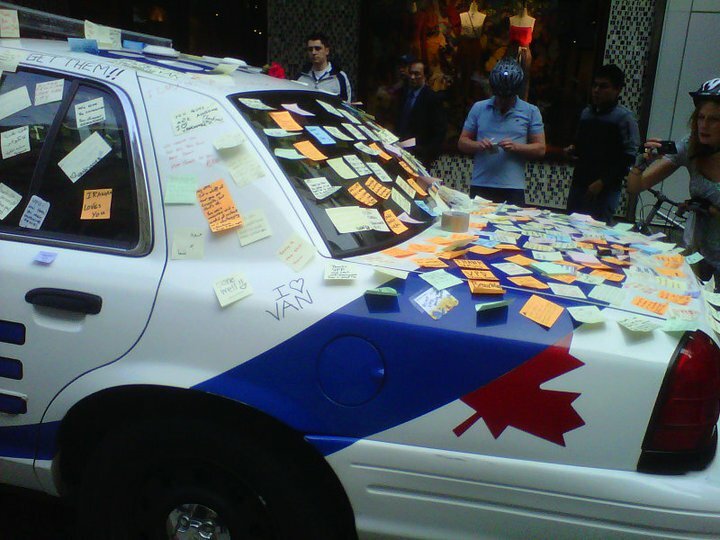 When the policemen returned, the car was covered in post it notes with thank you messages. More photos here. 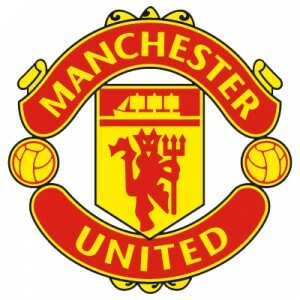 Manchester United’s manager Sir Alex Ferguson recently hinted that his players may be banned from using Twitter. Tonight his club will face FC Barcelona in the UEFA Champions League final on Wembley in London. This game between two of the world’s most popular football teams is predicted to be one of the best finals in a long time. Discussions and opinions about the game will be all over social media and it will probably dominate the trending topics on Twitter today. In spite of Ferguson’s hesitancy towards Twitter, both clubs have managed to gather quite a large following in social media. 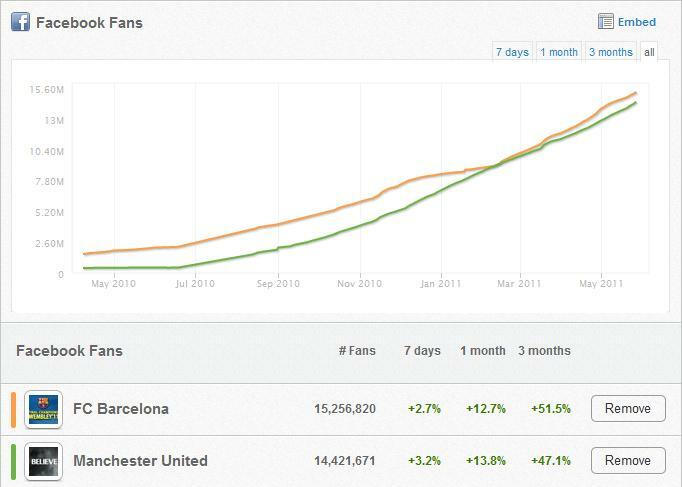 The question is, how does Man Utd stand in comparison to FC Barcelona, in terms of presence in social media? Both teams are very active and a typical status update can draw as many as 30,000 likes and 3,000 comments. Man Utd has 14,418,000 fans on Facebook, Barcelona has 15,311,000 fans. United is also growing its fanbase slightly faster during the last month. The teams are also active on Twitter. 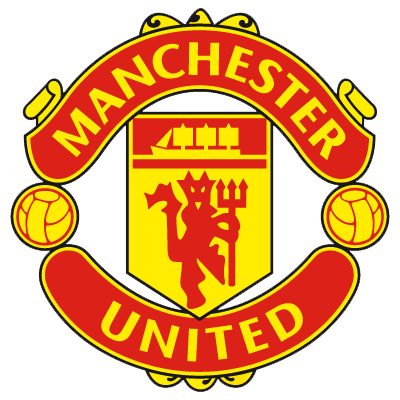 Man Utd has 282,900 followers, FC Barcelona has two major Twitter accounts, one in Spanish with 826,200 followers and one in English with 719,200 followers. 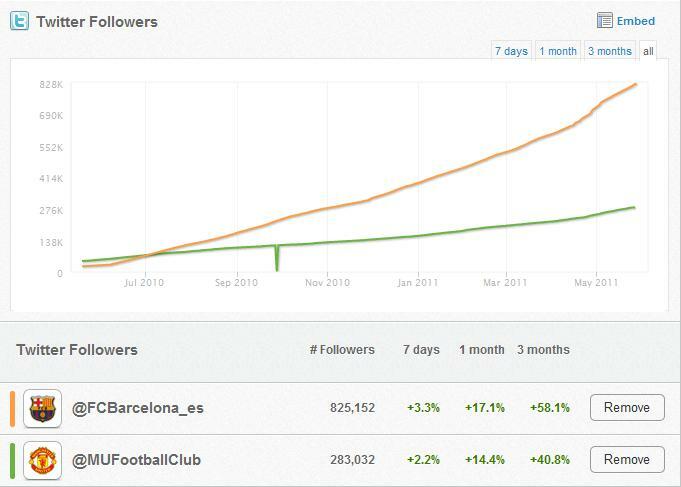 The Spanish Barca account has been growing more rapidly than the Man Utd account. Manchester United publish videos on MUTV, on its own web page and from what I can find, the club is not active on YouTube. Barcelona on the other hand, has an active YouTube channel with 82,600 subscribers and a total of 42.2 million views. But Man Utd frequently posts videos on Facebook, so the English team has merely chosen a slightly different strategy. Conclusion: both teams have millions of fans that follow them via social media, but FC Barcelona is slightly more popular. This has probably no impact on tonight’s Champions League final, but be sure that fans will actively cheer for their teams tonight and celebrate (or mourn) the outcome. May the best team win! Footnote: stats from Wildfire App.